Posted on April 28, 2015 at 11:30 am. The only thing more exciting than winning more than AUD $3.6 million in an online pokies game, is not even realising that you’ve won this life changing amount of money. That’s exactly what happened to one lucky player at Guts Casino, who had no idea she’d landed the jackpot until a rep from Guts called to congratulate her on her monumental win. A loyal punter at Guts Casino, Swedish player known only as Monica, had been trying her luck on the progressive jackpot pokies game, Arabian Nights, during the early hours of April 23rd. Despite lining up the winning five symbols and triggering the epic jackpot, disbelief held Monica back from the reality of the situation and she simply continued on spinning the reels oblivious to the her win. It wasn’t until she received the call from Guts that she realised the €2,633,052 win was real, and even then she took some convincing before excitement eventually took over. Monica was understandably ecstatic with the news and says she will use her millions to pay off her mortgage, help out her family, donate to charity and enjoy some time travelling. It sounds like the money has definitely gone to a good home! 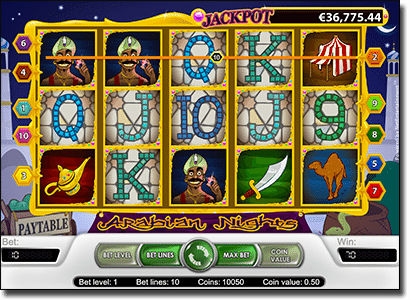 Arabian Night is a popular five reel progressive jackpot pokies game from leading software provider, NetEntertainment. 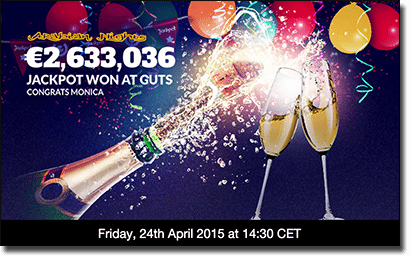 The jackpot has now been reset but with word of Monica’s record win, the value is sure to soar again in no time. Head to Guts.com to take advantage of a $300 welcome bonus and 100 free spins on Twin Spins pokies to get you rolling. Arabian Nights is among a collection of 29 progressive jackpot pokies at Guts waiting to claim the next online millionaire. As the weather gets colder outside, there couldn’t be a better time for some of our favourite gaming providers to treat us to new pokies, helping us find a reason to stay warm and cosy at home. April has been a huge month, with new games dropping every week, some which are bound to go down in the history books. Microgaming is determined to ensure it lives up to its reputation as the foremost gaming provider, with several big new video slot releases in April alone. The David Copperfield style Rabbit in the Hat is already one of our favourites of 2015, with vivid graphics and entertaining animation providing hours of good, light hearted play. Microgaming partnerships have resulted in multiple releases this month, including Rabcat’s Dragon’s Myth, an exciting game that follows a courageous young dragon hunter and her quest to find matching dragons across the reels. A partnership with Canadian company Bluberi has also seen the recent release of Honey Buziness, a fun cartoon style pokies set amongst a busy bee hive with two innovative bonus games that give players the chance to significantly boost their winnings. The long awaited Dracula pokies has now officially been released from NetEnt to rave reviews. This Universal Studios partnership has been talked about all year, with players flocking to see the crystal clear graphics and suspenseful game play for themselves. Lovers of the horror genre will not be disappointed, with this game adding a striking addition to the Universal Monsters online slot collection. Other notable releases include Golden Legend, Tower Quest and Easter Eggs from Swedish gaming bigwig Play’n Go. Trustworthy venues like Guts Casino are offering these new titles along with hundreds more and provide the ideal platform to enjoy playing pokies for real money from the comfort of your own home. Select titles like Dracula are also available in mobile form and can be played from your Smartphone or tablet with a WiFi, 3G or 4G connection. With this much action happening in April alone, we can’t wait to see what the next few months have in store. A 90 year old grandmother from the USA state of Illinois was recently denied claim to a pokies win of US$41.8m. Pauline McKee was playing the popular Miss Kitty pokies at a land based casino in 2012 when she landed on a small win of $1.85, however at the time of the win the machine subsequently flashed a message telling her she had won $41,797,550.16. The casino immediately dismissed the win, citing an error due to a glitch in the system, to which Ms McKee pursued legal action. She sued the casino on account of consumer fraud and breach of contract. On the 24th April the casino won the dispute, winning the argument based on the fact that the on-screen rules clearly indicated that “malfunction voids all pays and plays” which is a standard stipulation included in the terms and conditions of most pokies. Further investigations revealed that the game was only programmed to have a maximum jackpot of $10,000, with programmers perplexed to how the multi-million dollar announcement managed to appear at all. This story highlights the importance of being aware of the terms and conditions of any pokies game you participate in to avoid any disappointments. Playing pokies online makes it easy for players to check the guidelines of game play and to clearly read for themselves the rules surrounding any such stipulations. Our recommended casinos come equipped with high level customer service teams so if you ever have a question regarding the terms of a game someone from the service desk will be more than happy to help.